Green Hotelier Award 2018 - apply now! The Green Hotelier Awards, which seek to discover the world's most sustainable, environmentally friendly and socially responsible hotels, has launched for 2018. Will a Green Key awarded establishment be the winner this year? This year the Awards unveil a new look which changes the winning categories. In previous years hotels have been grouped geographically. This year hotels across the world will compete to win in categories which examine their carbon footprint, their water stewardship, their waste reduction, their community impact and their role as a responsible employer. The move aims to align the awards with the industry call to action of the International Tourism Partnership(ITP) for hotels to focus their sustainable, environmental and socially responsible actions on the United Nations’ Global Goals also called the Sustainable Development Goals (SDGs). Green Hotelier Editor Siobhan O'Neill said, "The Green Hotelier Awards have been growing in popularity year on year and we expect record numbers of hotels to share their sustainability stories with us in 2018. Although the form hoteliers will complete is essentially the same as previous years, the new approach allows us to focus on the winners' actions and impacts, rather than their geographical location. In addition it means there will be more winners and hotels named Highly Commended because we've increased the number of categories we're awarding in. "We wanted to reflect ITP's call to action to the hotel industry to work together to achieve the Global Goals, and we can use the Green Hotelier Awards to show hoteliers how their sustainability actions and initiatives are doing just that. The application process is still free and deliberately designed to be quick and easy. The scoring on each section is simple and transparent, and hotels will need to complete every section to be in with a chance of winning, but we'd like them to indicate which category they think they're a strong contender in. It doesn't mean they won't be considered as a winner in other categories as well. "We're really excited to be launching our new look and we're looking forward to reading all the amazing sustainable and responsible business actions we know so many hotels around the world are actioning for a fairer future for all." The new look Awards means that no hotel is excluded from entering. Previous winners can apply this year. The Awards are open to hotels, resorts, eco-lodges and B&Bs of any size, anywhere in the world. Entrants should read all the rules and tips for applying before completing the form to make sure they maximise their chances of winning. The closing date for entries is Friday 23rd March 2018, and the winners will be announced in April during Responsible Business Week. Download the form as a pdf here or as a Word document. 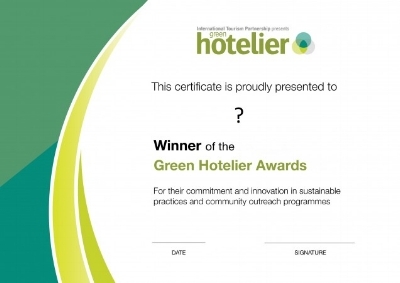 Completed forms should be emailed to info@greenhotelier.org. The judges look forward to receiving the Awards and showcasing the winners' actions in support of the Global Goals. Green Key wishes all Green Key awarded establishments that participate good luck! Denmark Farm Conservation Centre has made a great start to 2016 by being the first organisation in Ceredigion to gain an internationally recognised environmental accreditation and finishing 2nd in the International Green Key Best Practice Competition. Left to right: Emily Wells from Keep Wales Tidy (Green Key), Mara Morris from Denmark Farm. Denmark Farm Conservation Centre is run by the Shared Earth Trust, a registered charity established in 1987 in direct response to the national decline in wildlife habitat and biodiversity of farmland. As well as offering eco-friendly self-catering lodges and campsite, Denmark Farm run a programme of events and workshops developed to engage people with wildlife, sustainable living and natural crafts, ensuring that the environment is at the heart of everything they do. The Eco Lodge is located in 40 acres of nature reserve with trails around the site leading to wildlife watching hides, ponds, lakes, and meadows, woodland all designed to engage and educate. Rainwater is harvest for use in the toilets and the Sedum roof of the lodge creates a natural habitat for wildlife and insects. The lodges are all heated by a biomass boiler and much of the furniture is made locally. "As a conservation charity (The Shared Earth Trust) we were attracted to gain a Green Key Award for our Self-Catering Eco Lodge because Green Key Wales is managed by the environmental charity Keep Wales Tidy. Our ongoing work on the Environmental Action Plan has helped us to consider aspects of sustainability we had never touched upon before and further develop our green offering. Many thanks to Keep Wales Tidy and Green Key Wales for running this excellent and much needed programme". Despite the fact that they only got Green Key accredited at the beginning of the year, they already won 2nd place in the Green Key Best Practice competition in February with their WET (Wetland Ecosystem Treatment) System. A system for treating waste water using natural processes. A WET System has specially designed and constructed ponds and earth banks, densely planted with wetland trees and marginal plants. As wastewater flows through, it is both purified by microbiological action and transpired by growing plants. In the process, a beautiful, species-rich wildlife habitat is created, including a willow resource that can be used for basketry, hurdles, garden features or fuel, depending on the coppice cycle. Additionally, a WET System requires minimal imports of resources – the site’s soil (rather than quarried gravel) filters the wastewater, fossil fuels are only consumed during construction and there is no ongoing electricity use. In fact, the whole process increases in efficiency over time, as new soil builds up and root systems extend – both of which also increase carbon dioxide storage as biomass, whereas conventional treatment systems need regular maintenance and energy inputs. ‘This ecosystem approach fits our philosophy of working with, rather than against nature. And the beauty of it is that we have fewer costs and many benefits. So why aren’t these systems more common? One hurdle may be lack of familiarity, which is where we come in. Our WET System is the first in Ceredigion and one of only a few in Wales – so far! As a demonstration site, we can show statutory bodies, trainees and visitors the potential for farms and other industries that have liquid organic waste. With biodiversity benefiting too, the future looks bright for wetland wildlife,’ states James Kendall from Denmark Farm. A detailed description of the system will soon be available under resources as part of the Best Practice publication.